Being born in the Saraswat Brahmin family, the environment at the Murdeshwar home at Masur (in North Kannara district of Mysore State) was more than congenial to musical sensibilities of Devendra. His father was a keen connoisseur of music and also played on the violin, the flute and the tabla as a joyous hobby. All this made a deep impress on the mind of the impressionable young Devendra. A chip off the old block, schoolgoing Devendra also learned to play on the flute and the tabla. He showed a flair for singing stage songs and playing Banjo (Bulbul Tarang) and Harmonica too. Please update your browser to have access to modern website features like this audio player. Curiously, however, his interest in music remained relatively dormant till he came to Bombay in 1941. His sojourn in the metropolis brought many opportunities to hear the great musical stalwarts of the time like Pt. Omkarnath Thakur, Ustad Bade Gulam Ali Khan, Ustad Aman Ali Khan, Pt. D.V. Paluskar, Pt. Ratanjankar, Surashree Kesarbai Kerkar, Pt. Ravi Shankar and Ustad Ali Akbar Khan and many others. Even while he worked as a sales representative, he found time to learn the tabla from the late percussion maestro Ustad Amir Hussain Khan. He also received guidance in vocal music from Master Navrang and even studied commercial art. At this time only he came in close contact with another great vocalist Pt. S.C.R. Bhatt, a disciple of Pt. Ratanjankarji who used to teach Smt. Lalita Kalambi - a promising vocalist and Devendra's cousin. It was his long and regular discussions with Pt. S.C.R. Bhatt while sipping tea at a corner Irani Restaurant in Santacruz, gave him the in depth knowledge of the various ragas. 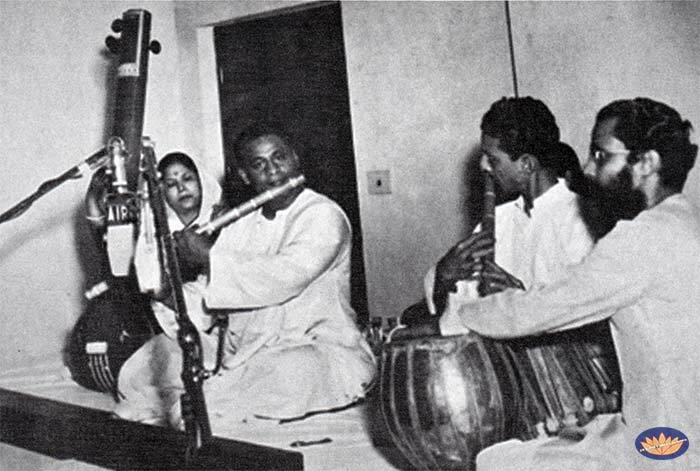 The great moment in his quest of music came when Murdeshwar chanced to hear the inimitable flute maestro, Pannalal Ghosh, a disciple of Baba Allauddin Khan of Maihar in 1947 while he was still learning under Ustad Amir Hussain Khan and was known as an accomplished Tabla player. So abiding was the impact of Panna Babu's music on his mind that he decided to learn the flute under the guidance of the great master. And it was his great Ustad, Tabla Maestro Amir Hussein Khan who put a word for Devendra to Pannalal Gosh and was accepted as disciple. Murdeshwar practiced day and night with exemplary diligence: and it was not long before he became a prime disciple and a well-known flutist. Murdeshwar joined the staff of All India Radio in 1950 as a flutist in the National Orchestra under Pt. Ravi Shankar. It was his quest for the knowledge that brought him very close to Pt. Ravi Shankar and he became his trusted lieutenant. It was this association with Pt. 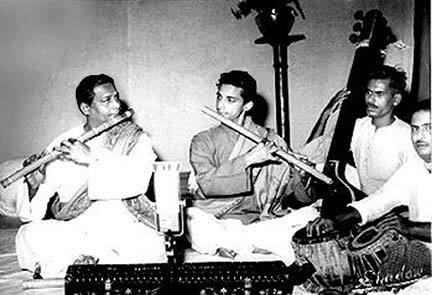 Ravi Shankar made him learn in detail the many aspects of different styles in various Gharanas of Classical Music. In his service with A.I.R. at Delhi, he also came in close contact with many maestros in the field of music like Ustad Hafeez Ali Khan, Legendary Ustad Baba Allauddin Khan Sahib, Bade Gulam Ali Khan, Amir Khan, Pt. Behere Buwa, Pt. Ratanjankar, Pt. Mallikarjun Mansoor and many others. Devendra's yearning for knowledge would make him discuss intricacies of various new ragas and its technicalities with these stalwarts. This added to his vast repertoire. He became famous not only as a most versatile flute player but also as one of the most knowledgeable musician among his contemporary. He became known for his strict adherence to the purity of the raga and intelligent and aesthetically melodious renditions. Pt. 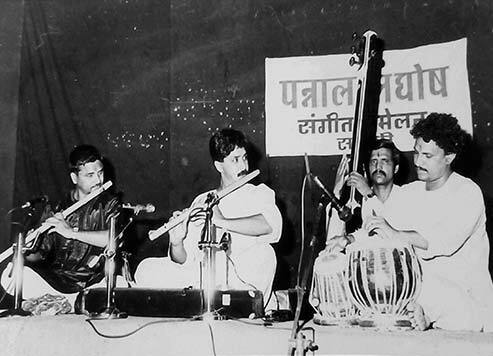 Devendra Murdeshwar performing with his guruji, Pt. Pannalal Ghosh. He participated in all important music conferences in the various parts of India, including National Programmes of Music and Akashwani Sangeet Sammelans. Devendra Murdeshwar ranked high among India's eminent flutists. His art at once revealed the master's touch. But to this master's touch he added a prodigious talent, an unstinted industry and an unequaled determination. The result - such mastery of technique and suavity of presentation as belong only to true artistes. Recognition came his way. He represented the Government of India as member of official cultural delegations and had occasions to perform before vast audiences in Nepal, Afghanistan, Russia, East Germany, Yugoslavia and Bulgaria. He also toured US for the chain of concerts. He was honoured with Sangeet Natak Academy Award and given 'Gaurav Puraskar" by the Government of Maharashtra. I had multi - faceted relationships with him. But mainly as a senior disciple only. During my tenure of 15 years of studentship with him, I observed him as a GURU, as a maestro, as a brilliant scholar, as a producer of All India Radio, as a friend and also as an outstanding craftsman and a humorist and as a kind generous affectionate man. As a Guru, I found him to be extremely disciplinary and demanding teacher. His lessons were systematic and he had a knack of simplifying complicated thing, which would make the subject easier. He would give numerous examples to prove his point. He would explain a particular raga with its peculiarities and also explain the relevant similarity these raga have to the particular ragas. He would differentiate these by singing numerous phrases common to both the ragas and then explain as to how to avoid confusion between these two. He would explain the present form of the raga and compare it with the traditional orthodox form and presentation of the raga. Some times he would put a question as to what mistake you do in a particular raga to sound it like so and so Raga? Such was his brilliance and scholarly intelligence. As a person he was very decent, affectionate, lively and full of wit. His observation was tremendous. Even the minuet detail would not escape his observation. He had uncanny sense of humour and was a great mimic. His mime was a great pleasure to watch. Because of this, his music was full of expressions. Especially when there would be inspired reply or expression rendered by the Tabla accompanist. One could find his wit in his musical expressions. He remained very honest to his musical tradition and was never tempted to play for the gallery. He would always advise me "Don't go down to the level of the audience, but bring the audience up to your level." He remained faithful to his opinions, teachings and principles. He never believed in false praise or flattery of any body for the sake of some gains. He kept himself out of gimmickry. He faced lots of difficulties in his professional life, but never compromised his principles. He had tremendous faith in his family Deity and Guru parampara. His entire friends, relatives, and students and the music lovers all over will miss him. Shree Anand Murdeshwar was the son of Devendra and grandson of Pannalal Ghosh. Anand was a very fine artist on bansuri who sadly passed away at a very young age in the early 2000's. 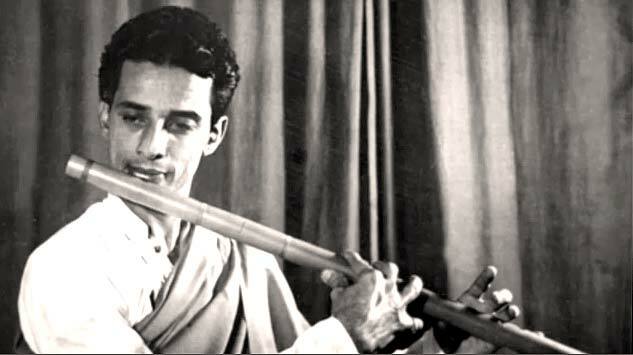 View Anand Murdeshwar's bansuri recital from 1994. Read an interview with Anand Murdeshwar.